After two decades of short films and video art, Belgian filmmaker Bavo Defurne has directed his first feature, North Sea Texas, a delicately wrought drama of a lonely gay adolescent’s sexual awakening. 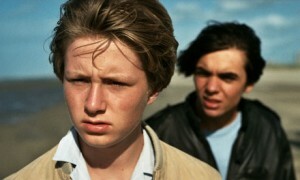 Jelle Florizoone (l.) and Mathias Vergels star in North Sea Texas. Set in the late 1960s, the story focuses on shy and neurotic, Pim (Jelle Florizoone), who lives with his overweight ex-beauty queen mother (Eva Van Der Gucht) in the small town of Ostend on Belgium’s North coast. She regularly leaves him alone to run off with various men and pursue gigs as an accordionist. During one such absence, Pim is befriended by another single mother (Katelijne Damen), and her two children, Sabrina (Nina Marie Kortekaas) and Gino (Mathias Vergels). Sabrina develops a crush on Pim, but she can’t compete with the more aggressive Gino. As the three approach adulthood, family tensions worsen and sexual conflicts come to the fore. The acting, however, is naturalistic and it is the performances that truly elevate the film. Van Der Gucht and Damen are excellent as two middle-aged women coping with life’s disappointments in opposite ways: drunken sluttishness for one; resignation and illness for the other. Nothing less than extraordinary are the two young actors at the center of the love story. Florizoone and Vergels bring a sexual awareness that in itself may not be surprising, but their ability to enact it on camera with such naturalness is definitely an art that conceals art. They make the outcome inevitable and deeply moving. It’s well worth taking a trip to North Sea Texas.